Music, Movies, Meanings, and Markets focuses on macromarketing-related aspects of film music in general and on the cinemusical role of ambi-diegetic jazz in particular. The book examines other work on music in motion pictures which has dealt primarily with the traditional distinction between nondiegetic film music (background music that comes from off-screen and is not audible to the film’s characters, to further the dramatic development of plot, character, or other themes) and diegetic music (source music produced on-screen and/or that is audible to the film’s characters, adding to the realism of the mise-en-scène without contributing much to other dramatic meanings). This book defines, describes, and illustrates another hitherto-neglected type of film music –ambi-diegetic film music, which appears on-screen but which contributes to the dramatic development of plot, character, and other themes. Consistent with an interest in macromarketing, such ambi-diegetic film music serves as a kind of product placement (suitable for commercialization via the cross-promotion of soundtrack albums, for example) and plays a role in product design. It also provides one type of symbolic consumer behavior that indicates choices made by film characters when playing-singing-listening-or-dancing in ways that reveal their personalities or convey other cinemusical meanings. Morris Holbrook argues that ambi-diegetic film music sheds light on various social issues –such as the age-old tension between art and entertainment as it applies to the contrast between creative integrity and commercialization. 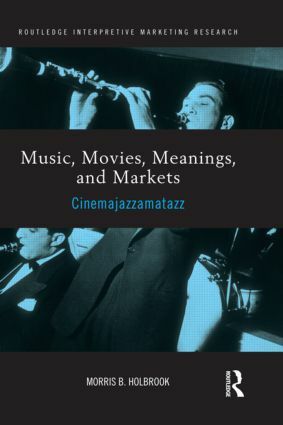 Music, Movies, Meanings, and Markets explores the ways in which ambi-diegetic jazz contributes to the development of dramatic meanings in various films, many of which address the art-versus-commerce theme as a central concern. Morris B. Holbrook is the W. T. Dillard Professor Emeritus of Marketing in the Graduate School of Business at Columbia University. His research has covered a wide variety of topics in marketing, consumer behavior, and related fields – with a special focus on communication in general and on aesthetics, semiotics, hermeneutics, art, and entertainment in particular. Recent books include Consumer Research (1995); Consumer Value (edited, 1999); and Playing the Changes on the Jazz Metaphor (2007).